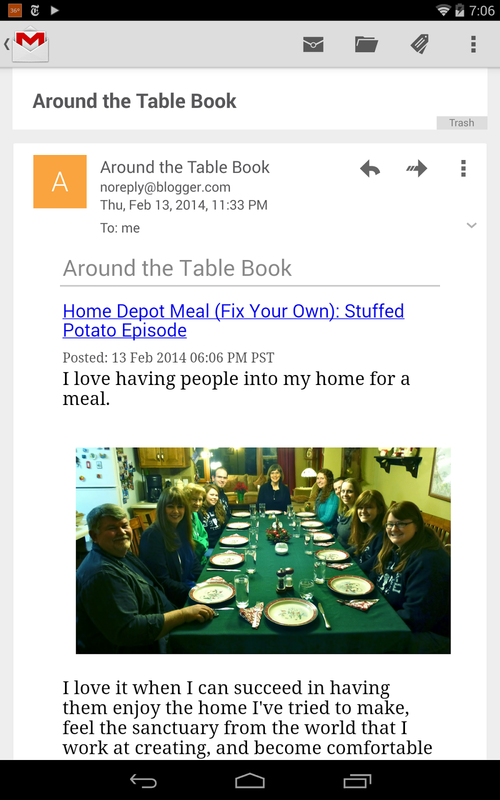 Around the Table Book: What Does Your Family Meal Look Like, Betty Predmore? What Does Your Family Meal Look Like, Betty Predmore? Can family mealtimes happen with teenagers, younger kids, and grandparents? They can! Betty Predmore, a fellow blogger and speaker, tells us how with humor, hope, and honesty. Join me as I talk to her. What unique thing I would notice about your mealtimes if I were at your house? It is one of the noisiest times of our day. Everyone wants to be heard, there is laughing, arguing, and event sharing going on all around the table. At least 3 people will be trying to tell me something at the same time. Having patience to let someone else finish talking before they begin, and about eating everything they are served. 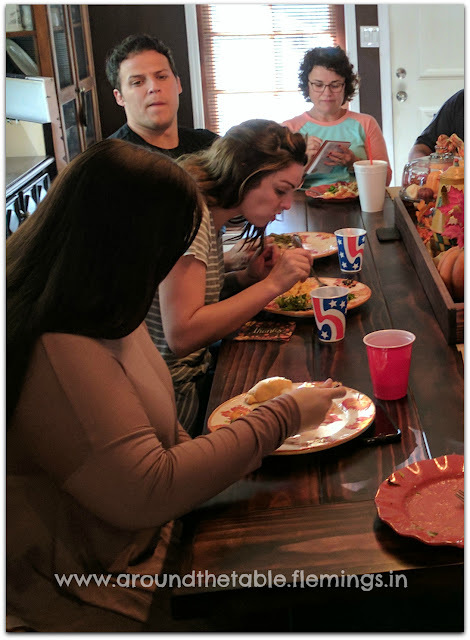 How do you handle cellphones at the table? There is a NO ELECTRONICS rule at the table. My son has even tried to bring his tablet to the table...but that didn't fly! When have you found yourself channeling your mother? Once I was trying to get my son to realize the importance of not wasting food and the same words my mother used to speak to me came right out of my mouth... "There are children starving all over the world and you want to throw away your vegetables?" What is your go-to meal these days? With 3 kids in baseball, and two parents hospitalized, not to mention our regularly hectic schedules, I am ashamed to say our go-to meal of late has been Mac-n-cheese. The kids love it, it fills them up, and it is relatively quick. We are so looking forward to our schedule slowing down beginning this week! If you could bottle anything and spray it over your table, what would it be? It would be peace. We are always in a rush, everyone is always trying to over talk the other, and I lose my patience. I would love a peaceful meal. What makes celebration meals special at your house? They are special at our house because we really try to make the one we are celebrating feel loved. We take photos and videos, and always try to serve their favorite meal. Typically, the adult kids try to be there to share in the celebration. What running joke do you have about your mealtimes? You can't leave your plate alone for even a second. Our littlest dog will be up there in a flash, consuming the entire plate of food. The kids think it is hilarious! Me...not so much. What is the best compliment you could ever receive about your mealtimes? The best compliment I could receive about our mealtimes is that we are a crazy, chaotic bunch of love. The youngest three are adopted and have blended so well into our family. We are truly blessed. What is the most unusual meal you have ever had? That would probably be the time my husband made risotto stuffed pork chops with a carrot-pineapple glaze that my husband created as an entry into a cooking contest. What is one invention you would like to see to make mealtimes easier? A machine that would not only wipe the table, but sweep and mop the floor as well. Oh wait...I have that...it's called my children!! 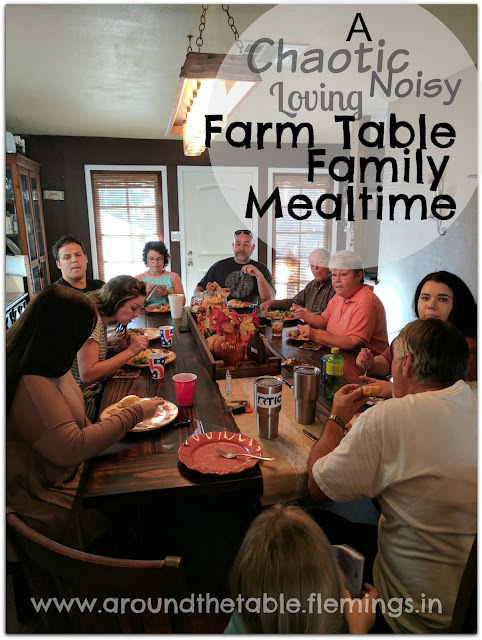 every single one of my children, my parents, my husband and I gathered around my huge farm table that was built by my husband, eating spaghetti...which is a family favorite. How do you bring Christ to your table? By always praying a blessing over our food, and by talking about Him during our meal. There are also many opportunities in mealtime conversation to teach the principles of the gospel. 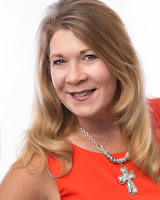 Betty Predmore is an author, speaker, blogger, and ministry leader. Betty has dedicated her life to sharing God’s Word in an inspiring way, sprinkled with honesty, humor, and encouragement, and reflecting the love of Jesus to all she meets. Find her blog at https://momsense.blog/ Interact with her through her Facebook page or visit her website at www.bettypredmore.com. 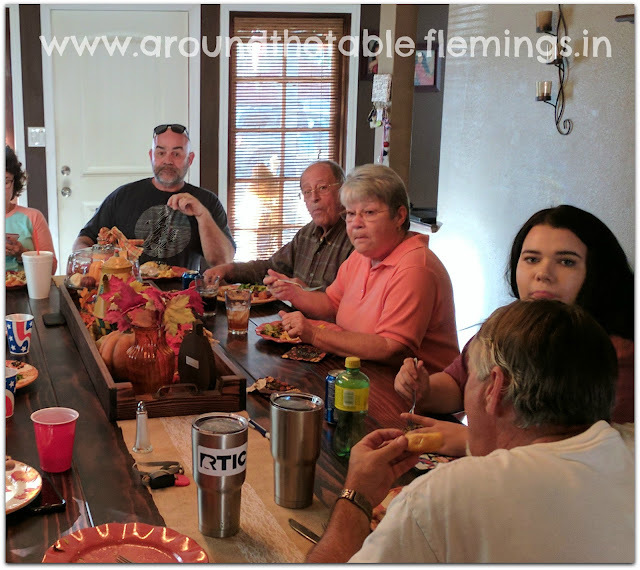 If you would like to be interviewed about your family mealtimes, please write to me at aroundthetableblog(at)gmail(dot)com. If you have a blog or website, I will be happy to provide a link.